I always do a "sun and moon" program right around now because it's around the anniversary of Neil Armstrong's setting foot on the moon. Today is the exact day in fact, and I have vivid memories of being allowed to stay up late (I was 7) to watch it happen on our black and white TV. This story time was hampered by the fact that I was going down a water slide w/my 12 year old Sunday and broke/badly jammed my little toe. Doesn't matter which I did, end result is the same--standing too much is painful and dancing next to impossible. Luckily, I had my 16 year old to help me today. SC is a lot of fun when she wants to be, she's good with little kids & she doesn't have stage fright. So I managed well. I have been a fan of Bill Harley for many, many years and love to tell his stories. I'm afraid my telling isn't as good as his by a long shot, but the audience enjoyed my version of "Bear's All Night Party" We had fun at the start planning the foods for Bear's party, and SC wore different masks in turn to be Bear's brother, a fox, a rabbit, Moose, a bird, a bee and finally, the Moon! I love singing the song that goes with this. 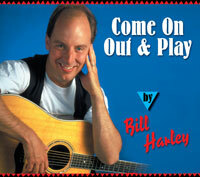 If you get the book, make sure you also look for the original CD where Bill first recorded this. 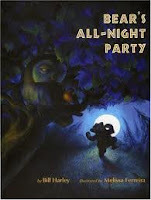 The title of the CD is also the original title of this story "Come On Out and Play"
Years ago, I was forced into having the local "Poet Laureate" as a guest at my programs. She turned out to be really nice though, so for the second program she did with me I did this lovely book by Nancy Willard. She read the script while I acted it out with the kids. I had masks for the sun and the moon and cut the nightgowns out of wrapping paper glued to oaktag (rectangles with a curve at the top so I could hold them under the "Moon"'s chin. For the part where people all over the world call for the moon, I used the computer to print flags for different countries with the word in each language for "moon" on them, and gave them to audience members to hold up. 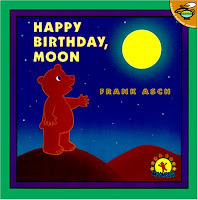 I love Frank Asch's simple stories about bear, and this one about how Bear tries to ask the moon what he'd like for his birthday (he ends up mistaking an echo for the moon's voice) is a favorite. I just needed a bear puppet, a hat, the moon mask and a tree branch ( from a fake Christmas tree) to act this out with SC. Normally I would have used a round cardboard piece covered with foil for the moon, but it went missing, and the moon mask worked pretty well. I did today's program as one of my "Great Big Story Times", so I didn't use this lovely Eric Carle book, but it's a favorite of mine for smaller groups. 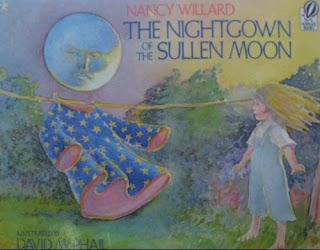 The foldouts tear when mishandled, so I don't circulate this book--it's a special story time treat. There was a man lived in the moon and his name was Aiken Drum! "Aiken Drum" is made from food from head to toe. Eyes, hair, nose, etcetera, and the audience has suggested everything from pickles to pizza. 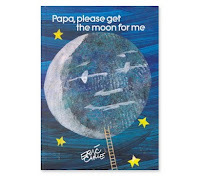 Easy to sing and great for bus rides, car trips and other times when a singalong is a good distraction. You can hear a clip of it here. That's all for this time. I've got one more story time next week before I take a break, but I've got at least 1 story time from June I haven't talked about here, and I'm hoping to get it up in August with a special extra feature! Ho Ho! I haven't heard Aiken Drum in years. I have no idea what happened to all my Raffi Cds. I have heard a lot of Bill Harley stories, but I'm not familiar with this one, nor with the second book, which has such an intriguing title. The other two have had many repeat performances at our bedtime story times over the years.